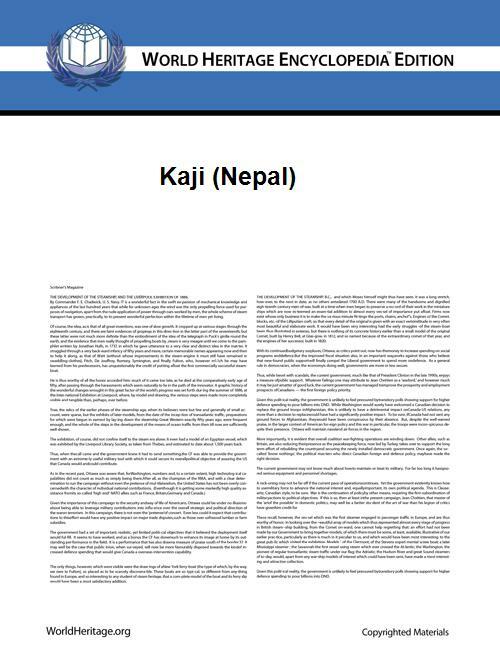 Kaji is a respectful title and position used by Nepalese nobility. The title was hereditary. The members of "kaji" family usually enjoyed high ranking posts of primeminister and commander in chief of the army. The "kaji" dominated the Nepalese politics throughout the 18th till mid 19th century. After King Prithvi Narayan Shah formed Greater Nepal,he honored four castes with the hereditary title of "Kaji". Basnyat, Bista, Pandey, and Thapa . This honorary hereditary title is in existence even in today's time as respective 4 castes are till date corresponded to with the title "Kaji" prior to one's family name. The respect that is to be provided to these elite classes of Kshatriya was even implemented to the likes of Brahmans, the highest of the Hindu castes. Similar, another form of Kaji System came into existence much later which was non-hereditary. The title 'Kaji' was provided to the representative of the people's governing body. As it was a non-hereditary title, this term was only enjoyed by the personal till he was incumbent to the King and the people. "Kaji" family were in power from the period of unification of Nepal. Different primeministers from kaji family ruled in Nepal. Thapas and Pandes were mostly in power who were the archrivals. Thapas and Pandes plotted against each to gain power. kaji Damodar Pande came in power in 1800 under the regency of Queen Rajrajeshwori, eldest queen of King Rana bahadur shah who was self exiled and left his infant son as king. But after his return from self exile with the help of kaji Bhimsen Thapa in 1801,Queen Rajrajeshwori and kaji Damodar Pande were kept in prison. kaji Damodar Pande was sentenced to death in 1804. kaji Bhimsen Thapa came in power and ruled for 34 years under regency of Queen Lalit tripura sundari. But after the death of the queen Bhimsen Thapa power declined.He was accused of poisoning an infant prince,so he was arrested in 1837. After his imprisonment pande regained their power back. kaji Ranajunga Pande became the primeminister. Kaji Mathbar Singh Thapa plotted against the Pandes and seeked revenge for the false accusation made against his uncle Kaji Bhimsen Thapa for poisoning the infant prince. At that time King Rajendra Bikram Shah gave all power of the state to his junior Queen Rajyalakshmi. Queen Rajyalakshmi who strongly supported the Thapas wanted the Pandes to move out. The power of Pandes were seized in 1843 and their property were confiscated. Thapas came back in power again. Pandes were mass slaughtered in May 1843. Some Pande family ran away while some were exiled. kunwar family were also given the title of Kaji in later years. After the Kot massacre of 1846 masterminded by Jungabahadur Rana Kunwar all the clans of Kaji were removed giving all the state power to Junga Bahadur Rana Kunwar, who established the Rana family rule in Nepal. Kailar - Kajilar (-lar suffix makes it plural, so that it means Kajis in Turkish.